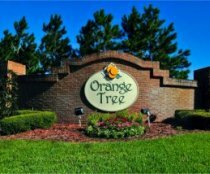 Orange Tree is an award winning community, situated in a prime location alongside the US27, 2 miles north of the US192. 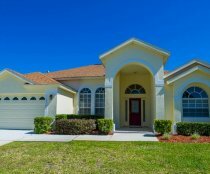 The development is less than 15 minutes from Walt Disney World, and is within easy reach of all major theme parks and attractions. This fabulous community has its own 5 acre manicured grounds which include tennis courts, soccer pitch, basketball court and playground's (Tot Lots). The community is covered in Orange Trees which you can pick if you are staying during fruit season. The homes have all been constructed by the award winning builders Greater Homes, renowned for their excellent build quality. All homes stand on larger than average plots. Shops, supermarkets and restaurants are just a few minutes away with a brand new Publix within walking distance if you don't mind the heat, or 2 minutes in the car. Just a few hundred yards further there is a Sweetbay for those who like local produce and more. Not forgetting the super Walmart just 5 minutes away. For restaurants on the US27 there is a Sante Fee, Chilli's and an Applebee's just a little further up the road, but of course you could head straight for the US192 exit and see many more restaurants along the way. Orange Tree is very close to the beautiful Lake Louisa State Park with its rolling hills, scenic landscapes and lakes abound where visitors can swim, hike, bird-watch, picnic, fish, canoe and take part in the programmed nature study events. All manner of wildlife can be seen and enjoyed by all. If you enjoy golf you'll love Orange Tree. 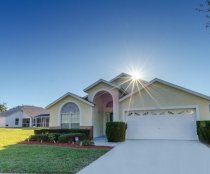 There are many golf courses within twenty minutes drive of the community including five championship courses in the Disney Resort area alone. Highlands Reserve Golf Club is less than 10 minutes away and boasts over 120 feet of elevation changes, making it one of the few hilly courses around. Most of the courses are open to the public, requiring no membership, only the payment of green fees. 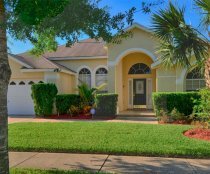 This luxurious 3200 sqft 5 bed 4 bath villa is located in the award-winning community of Orange Tree. The property benefits from an extended south-east facing not overlooked private pool & spa with spectacular conservation views. Along with an air conditioned games room, WiFi throughout and free use of a Weber gas BBQ. This luxurious 4 bed 3 bath villa is located in the award-winning community of Orange Tree. The property benefits from an extended south-east facing private pool & spa. Along with a games room, WiFi throughout and LCD cable TV's throughout. Our villa is nestled on the peaceful Orange Tree community, which is known for its large plots and luxury villas. Less than 10 miles from Disney and close to all other major Orlando attractions,it is well placed for everything. From the minute you walk through the door you can enjoy the space and luxury you deserve for your vacation, from the large family room right through to the fully equipped kitchen you will have everything you will need to make lasting magic memories.